If you combine the fact that many photographers will have got new or unwanted camera gear for Christmas, with the reality that a lot of people need to recoup funds after spending too much over the holiday season, then right now is a great time to be looking for bargains on the likes of auction sites like eBay. 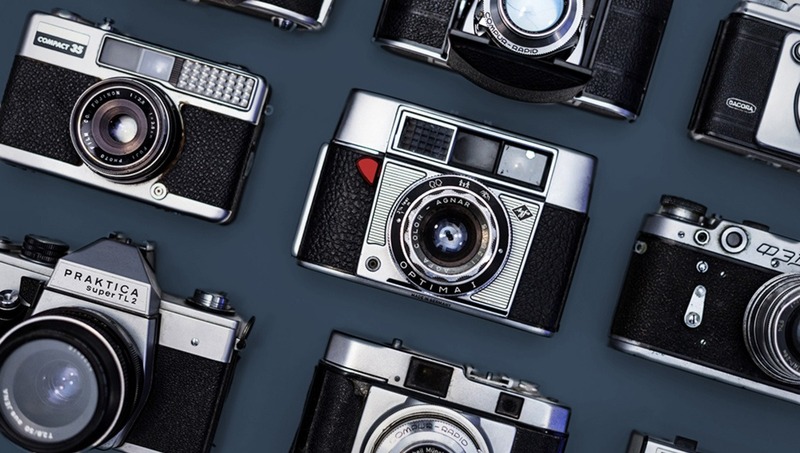 It's for this reason, that if you were considering making any camera related purchases anytime soon then now might be a very good time to start looking and bidding. While the suggestions mentioned below focus on the platform of eBay, many of the pointers can easily translate over to the likes of Facebook and Amazon Marketplace, Gumtree, and Craigslist. So without further ado here are 10 things to consider before placing your first bid. So you've jumped onto eBay and found just what you were looking for. Before you crack open that left over bottle of Champagne from Christmas make sure everything on the listing looks ok first. If you're buying a camera body it should clearly state how many shutter actuations it has already completed. I have talked at great length on this subject before so do check the numbers before you commit to bidding. You wouldn't buy a used car without knowing the mileage and buying a secondhand camera with a shutter should be no different. Always scrutinize the description and make sure everything pictured is included. If something isn't pictured or mentioned in the listing then it probably won't come with the sale. 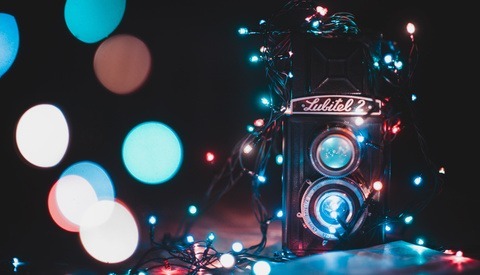 Power cables, straps, and batteries may usually come as standard with a brand new camera purchase but are not necessarily guaranteed in the secondhand market. For this reason, you need to factor in the price to replace any missing parts to determine if your bargain really is as good as you first thought. Make sure you dig deep into who is behind the item you want to buy from. Check on their feedback and navigate to the seller tab to see how many items they have feedback for as a seller. If they have lots of feedback which is negative then get ready to run for the hills. For important purchases like camera gear it really isn't worth the headache to go with someone with a less than perfect record. 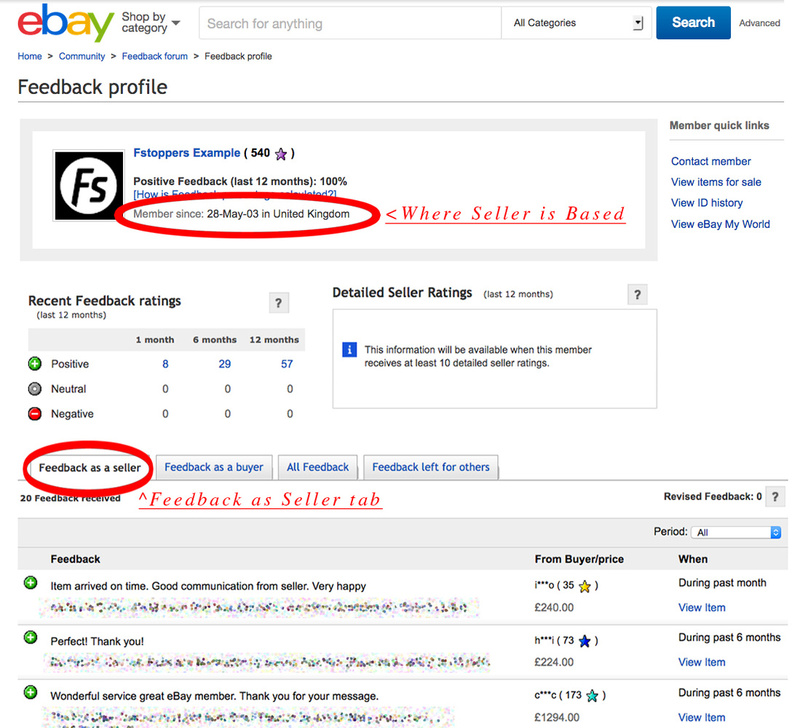 While you are on the seller's feedback page make sure the location where they claim to be based in the auction matches up with what eBay has on file. Unfortunately, there are some less than honest sellers who will pretend to be from your country to attract your custom but are in fact from overseas. This lie could cause you serious problems when it comes to custom and import charges as well as greatly delaying the time it takes for an item to arrive. If a seller is using underhand tactics then you have to worry what else they may be willing to do or say to make a sale. Personally, I wouldn't buy something expensive from overseas. Not only do you have to contend with custom and import issues but there is always the chance something could get lost or majorly delayed while in transit. It's also a pain if you have to send a faulty or wrong item back. If you really must buy from overseas makes sure you take any additional costs into account and insist that the item is both insured and tracked correctly. 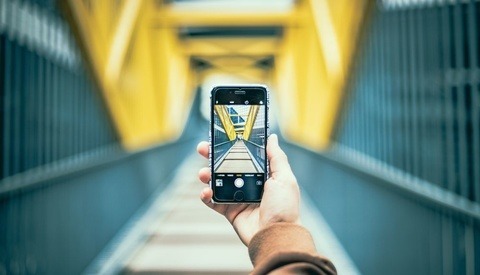 For more generic photographic items always take advantage of being able to sort listings by their location and look for auctions close to you. I have bought various light modifiers and stands from local sellers earlier on in my career which are still going strong to this day. Using local sellers means you can easily pick them up in person. The beauty of this is you can save on postage costs and quite often for larger items that need to be picked up there is less competition from other bidders too. So you've checked out the seller's feedback etc. and now it's time to make contact with them. Drop them a line via the "Contact Seller" button which appears on every auction page to see how well and quickly they respond. If a seller is a little sketchy with communication or details on the item, it could be the first signs that you might have a headache if there's a problem further down the line. Continuing on from the previous point it's best to have a virtual paper trail in regards to the item you want to bid on. By using the eBay messaging service to contact them you have any assurances they make about an item in black and white. This is really important if you have problems with an item when it arrives. If you ever need eBay's assistance with a seller who refuses to offer a refund then they will use these messages to help build up a case against the seller which makes the refund process so much easier. 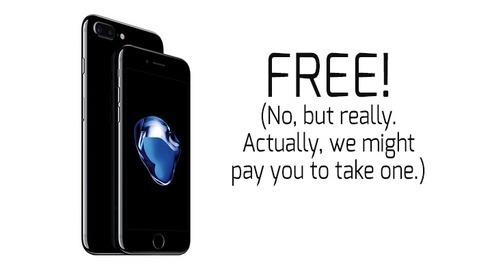 I once bought an iPhone off eBay from someone who forgot to mention the WiFi didn't work. Thankfully, I got a full refund but ever since that experience I have always made the seller spell it out that everything works with the item in question. Even if you decide to pick up items you win on eBay, I would still suggest you always try and pay for things you buy with Paypal. PayPal has something called Buyer Protection which covers buyers in case there is a problem. If an item doesn't arrive or is significantly not as described, Paypal will help you to get a full refund. I have had to use this feature a few times over the years and the process has been pretty painless. If I had opted to use alternative payment methods such as cash, check, or bank transfer I doubt the outcome would have been the same. If you're looking for bargains then take advantage of specialist search sites that can trawl eBay for all possible spelling mistakes made by sellers. An item's visibility is dramatically affected if it isn't spelled correctly which means less competition when it comes to bidding on it. Dedicated sites to help you find these hidden gems include Fatfingers, Baycrazy, Goofbid and BargainChecker. While I've never been a fan of haggling face to face I have no problem with it online. If you know the going rate for something or are on a tight budget then why not try your luck and haggle on the price. If the item has no bids and the seller is desperate to sell you might just be able to negotiate something. Just keep things polite and professional and fire over a message to the seller by clicking on the "Contact Seller" button which appears on every auction page. What have you got to lose? Just make sure you keep the transaction through eBay so you're protected if anything goes wrong. Saved searches are my secret weapon when it comes to eBay. I have all manner of obscure search criteria saved on my account and eBay will inform me when such items become listed. From random vintage camera lenses, to out of print photography books, I have managed to get some great bargains with minimal amount of effort. Enter your search into eBay like you normally would and then click on the "Save this Search" button. You will then be given options on how you would like to be alerted on new listings that match your search. To really narrow down the results you get always exclude words which are not relevant by using the minus sign operator. In the example above I am only interested in working cameras so buy typing "-faulty" in my search I won't ever see any listings which have the word faulty in them. Having used eBay for the last 15 years to buy all manner of items I have noticed that sellers of photographic equipment are quite often listing many other camera related items. For this reason, I always check to see what else they are currently selling. It is not uncommon to find that a photographer or studio has decided to sell everything they own related to the profession. While it's sad to see studios closing their doors it's a great opportunity for us buyers. I have found all sorts of bargains this way. If you were planning on buying off this seller in the first place you can usually get them to combine postage for additional items and make even bigger savings. So there you have it, how to make the most of eBay to grab yourself some photographic related bargains. The main thing to remember when buying online is to make sure you do your homework about the item and the seller, use secure methods of payment, and if a deal seems too good to be true always proceed with caution. Happy bidding! Have you ever bought secondhand camera gear online? Do you have any success or horror stories to share? I'd love to hear your thoughts in the comments below. Lead image by Free Creative Stuff, used under Creative Commons. Used ebay for years and your right that now is a good time of year for anything. Not just camera stuff. Fewer bidders means less people to push up the price. Do you find that there are fewer sellers as well? Thank you for the article, Paul! A few things you left out that I would like to add, 1) using the ebates plugin to get 2% cashback on your purchase through eBay, and 2) checking the recent Sold listings to determine if you are actually getting a deal on your eBay purchase. Also, Friday's after 5pm ET tend to be when bidding drops significantly. Great additions Steven, never heard of ebates plugin so will investigate that. Many thanks! My local police department has set up something in their monitored parking lot, an area right near the building for fulfilling purchases in an eBay/craigslist type context, so that you’re in a safe location and a stranger isn’t coming to your home. If your local police don’t have such a thing (and call, they might and you just don’t know about it), suggest it to them. It will benefit your community. We don't have them in my country but they are an excellent idea Dana. I hope people use them to stay safe over that side of the pond. Thanks for the insight! If you live in the Japan, you can’t do much better than Map Camera. Their “ok” condition equipment looks more or less as good as new and they come with a one year warranty. I am going there for a holiday soon would you recommend buying used from there even though I'm only there for 2 weeks? You can go into the shop, which is located in Shinjuku. Even if you’re only going for a short time, they are worth checking out if you are looking for used stuff in great condition at a reasonable price. The Nikon D850 sells for 400,000 yen in most shops, but they often have it used closer to 300,000 or less. Noted for future use, many thanks Jordan!